Nose: First nose introduces discreet notes of violet (Parma Violets! ), Hyacinth, and tubers. These delicate, elegant floral and sweet notes are complemented by dried flowers, leather and a particular rancio. Palate: Old books and spice, cedar wood and rancio. A truly stunning old Cognac. The finish is lengthy, the rancio is structured, and notes of orange and licorice appear. A very old Cognac from the highly sought after Borderies cru is the Grosperrin No.48 Borderies Cognac. 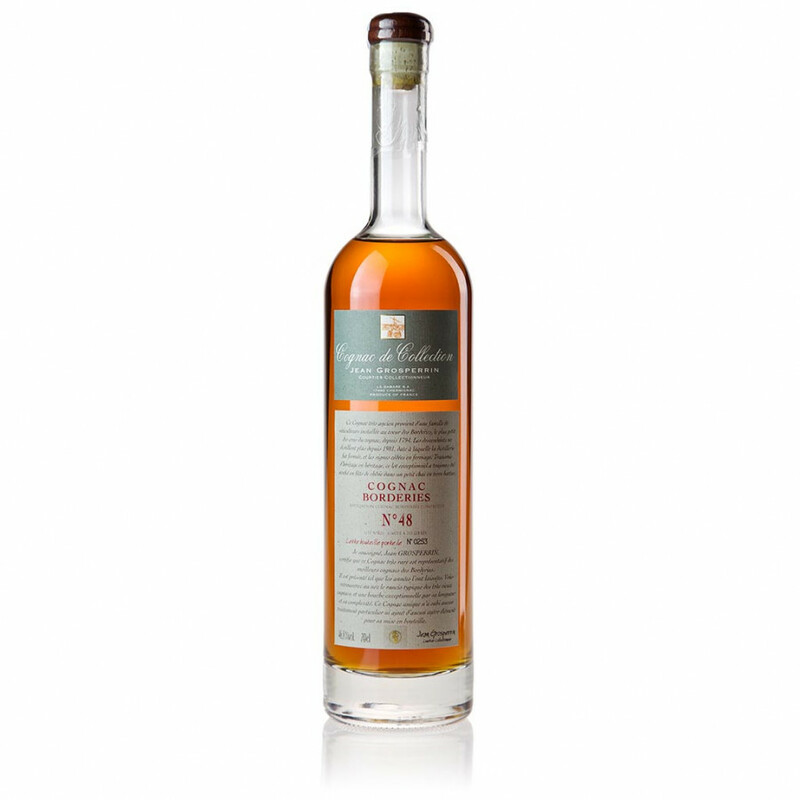 A ‘complete’ Cognac that has embraced its many years spent sleeping in oak casks, it is a result of years of savoir-faire and heritage dating back to 1794 descended from a family near the village of Saint-Sulpice de Cognac. With only a few precious hectoliters left, the family heirs today take the greatest care to preserve this unique heritage in the depths of their Paradis cellars. This Cognac dates back to 1948, making it a veritable piece of history in a bottle. The Borderies No.48 Cognac has an interesting story behind it. An 80-year-old couple sold the barrels to Jean in 1992, while his father-in-law had been a distiller and winegrower. Each year, he would give his children one or two barrels of the Cognac from that year, and it was these very casks that were sold to Jean Grosperrin years later. The cask of this very Cognac had been stored in a tiny cellar with no electricity, and had never been topped up after a large amount had evaporated! After 40 years they were only left with around 120 liters of the original 350-400 liters. It is for this reason that the remaining spirit has been guarded carefully and maintained to the highest of standards. The property was home to a series of exceptional hillsides in the Borderies, and one of the descendants, in fact, produced this fine Cognac. The Borderies 48 Cognac exemplifies the sweet, violet and honeyed notes typical of this cru, and has been deemed an ‘incredibly complex’ Cognac. Invite your senses on a journey through the history of this independent Cognac brand. Bottled at 46.8% ABV, the decanter is also slim and interesting. Grosperrin never adds sugar or caramel coloring to their Cognacs. Enjoy this Cognac neat, and witness history as it unfolds, tantalizing your senses.